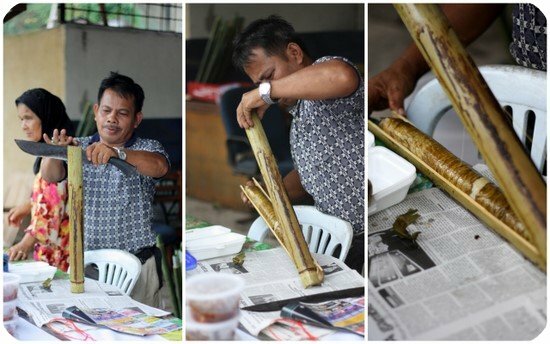 Celebrating Raya is not complete without some lemang (glutinous rice cooked in a bamboo tube), ketupat (compressed rice) and rendang. It is one of the best things I love about living in multiracial Malaysia since we get to enjoy the different culture's traditions. 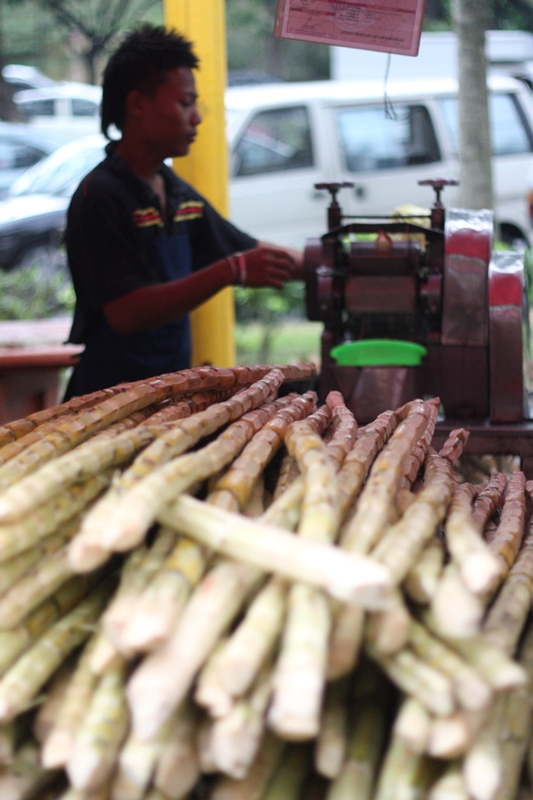 Makeshift lemang and ketupat stalls are mushrooming around town along highways. The PJ residents can head towards the stretch on Taman Tun Dr Ismail on the way to 1 Utama. These stalls now start out after the petrol station until the shoulder to the turn off to the Taman Tun Dr Ismail town centre. Even Kg Sg Penchala has some makeshift stalls. It is easy to spot these stalls...just follow the smoke. 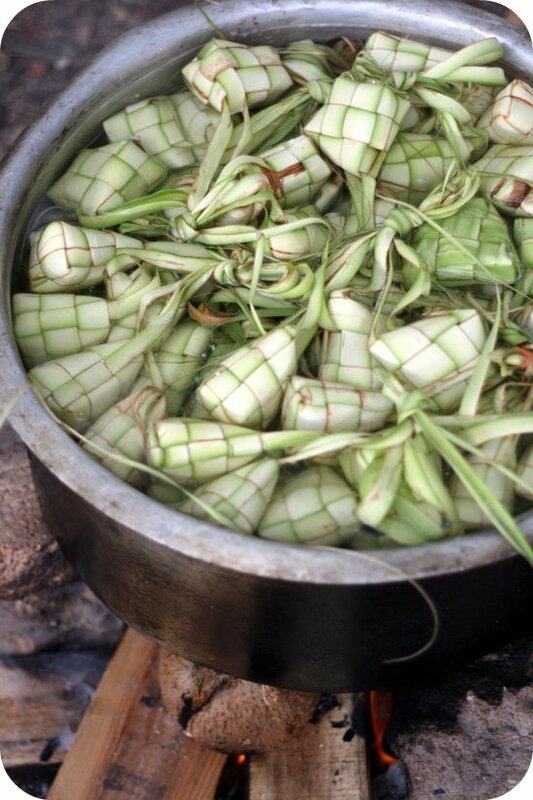 There'll be fires billowing everywhere make from wood and coconut husks to boil ketupat and grill the lemang. 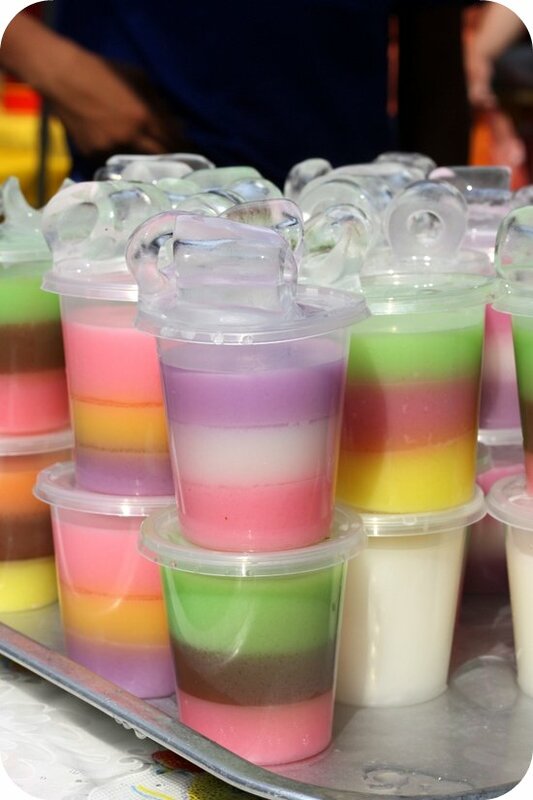 The KL residents can head towards Keramat and Kampung Baru areas where loads of stalls sell a variety of these Raya goodies. 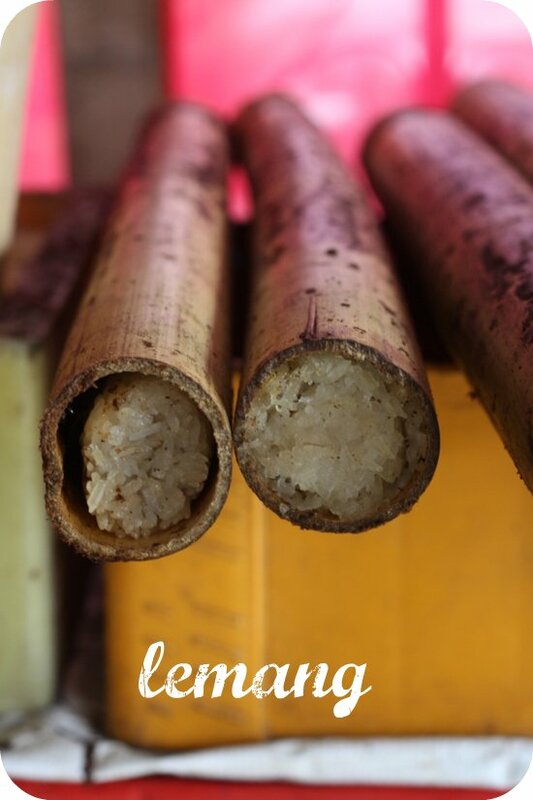 My personal favourite is the Lemang Asli Warisan place deep in the heart of Keramat AU5. This tucked away stall trades out from a house and usually regulars only know how to visit here. 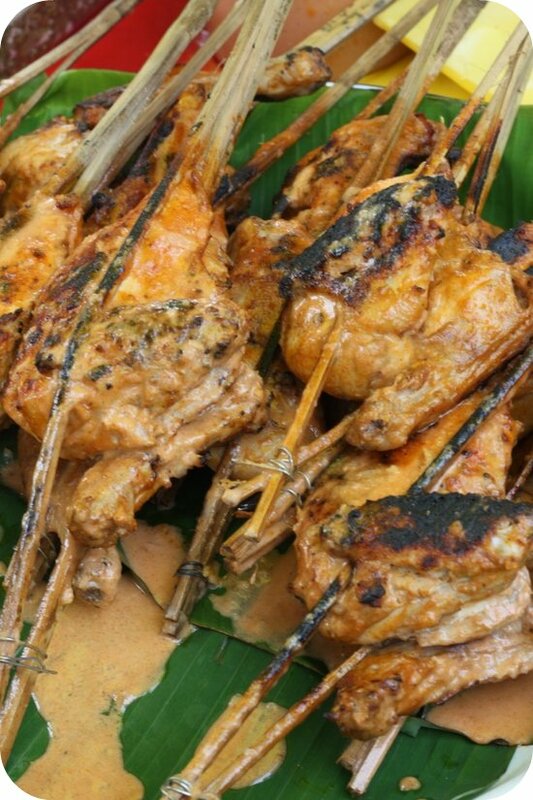 Pair off your lemang with a killer rendang (my favourite is still Perak's rendang tok) or serunding daging and it'll be a heavenly combination. 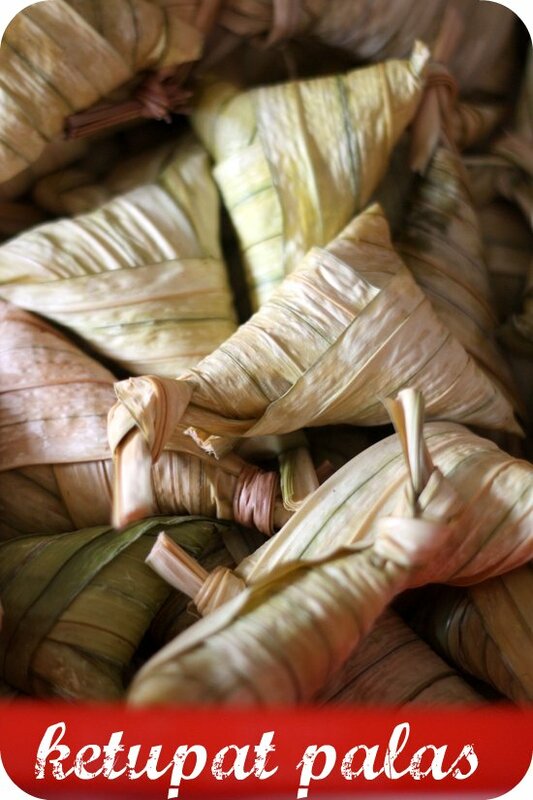 A personal favourite is also the ketupat palas, that is wrapped with softer palm leaves versus the harder coconut leaf casing. Selamat Hari Raya Adilfitri everyone. Maaf Zahir dan Batin. Enjoy the holidays. For more pictures, see my Flickr set. Hopefully it puts you in the mood for the festivities including the open houses filled with lots of good food. I must admit I get totally confused with the multitude of mooncake varieties. 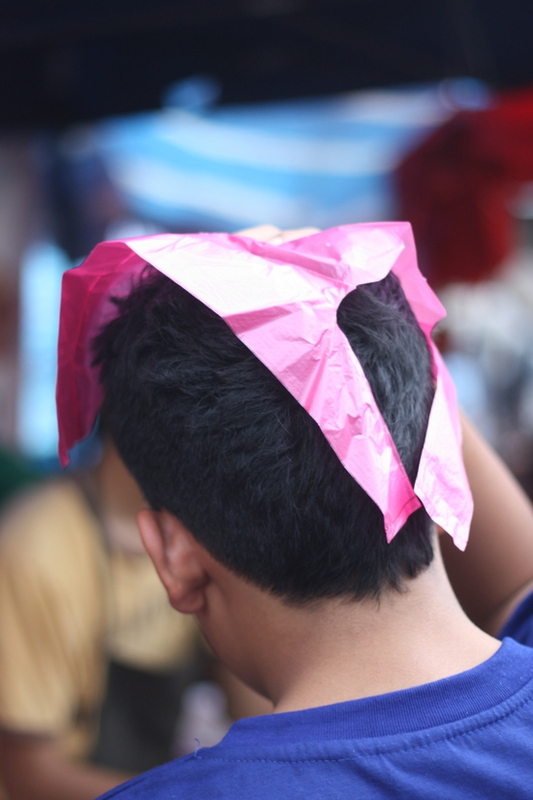 Every year, new ones emerge that reflect the current trends, kinda like the latest Paris fashions. Some flavour pairings are so outlandish that my brain can’t compute their compability until I taste how the flavours work together. Despite doing so many mooncake tastings for the past few years, I confess I never ventured for a taste of the Tai Thong varieties. After tasting my first batch of their baked skin mooncakes, I admit I should have looked a bit closer at this established restaurant backed with 20 years of mooncake experience. 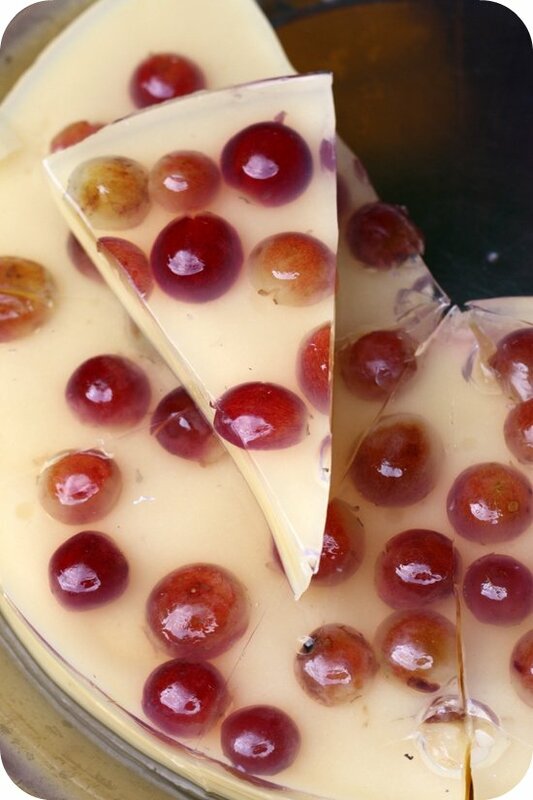 All the baked varieties have soft supple skins paired with interesting flavours – the work of Chef Yiu Weng Keung. I didn’t manage to sample their snowskin varieties but I understand Tai Thong uses imported flour from Hong Kong to get the soft texture for the mooncake. 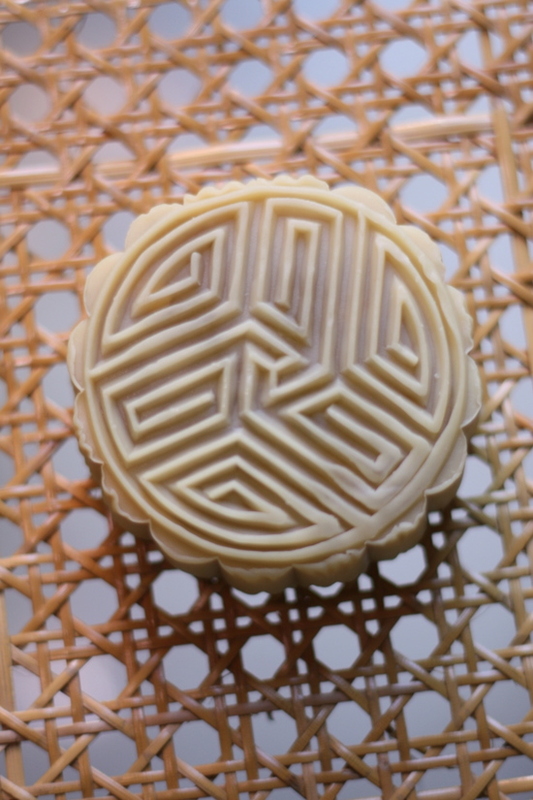 Unlike other places, their snowskin mooncakes also goes through a steaming process to prevent any bacteria growth. 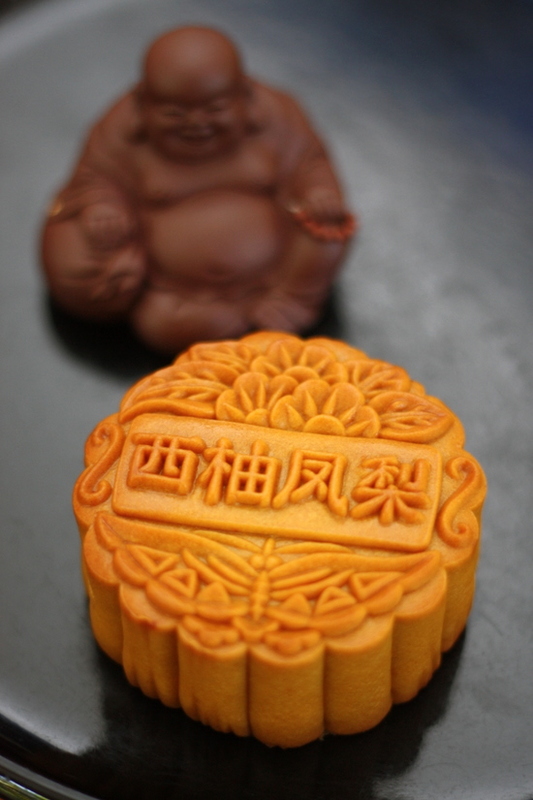 Emphasis has also been placed on the production of the mooncakes using stringent quality controls and manufacturing techniques that are in compliance with HACCP food regulations. 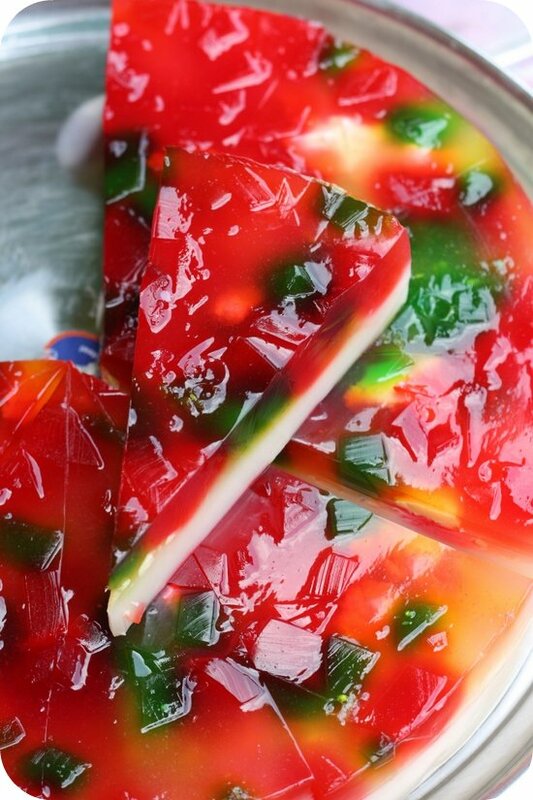 The traditional delight is preservative-free with no added artificial colourings and flavourings. Certified halal by Jakim, they’re good for Raya gifts. This year’s theme focuses on the four seasons (spring, summer, autumn, winter) from its packaging to the different flavours. 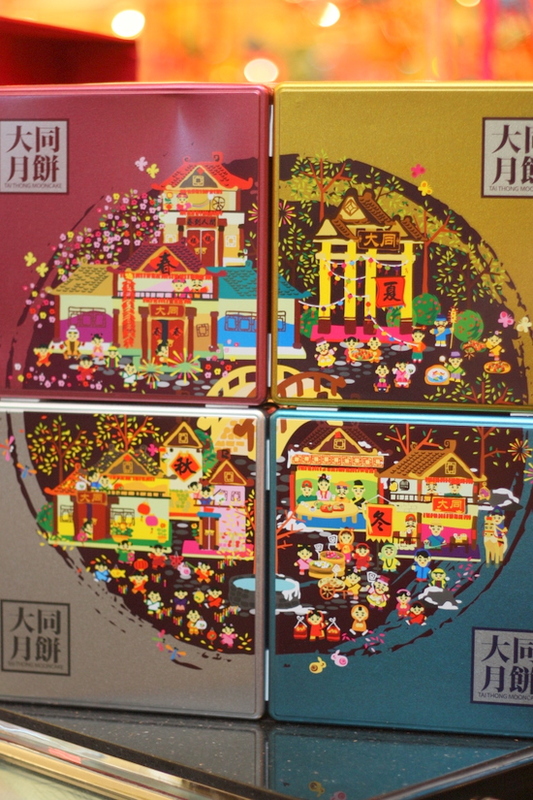 The four-piece mooncake boxes all depict a whimsical drawing showing a different Mid-Autumn festivity scene and comes in four colours. When assembled together, it forms a distinct pattern. Made from aluminium, these collectible boxes can be recycled into storage containers or even gift boxes. Two-piece boxes are also available. Also on offer is their corporate box for six assorted flavours together with three instant bird’s nest drinks. Always the pioneers in the market in terms of innovative flavours, this year Tai Thong introduces five flavours – four baked and one snowskin. The Wholesome wheatgrass with single yolk represents Spring, a green tinged mooncake with grassy flavours that goes well with the salty edge attributed from the salted egg yolk. 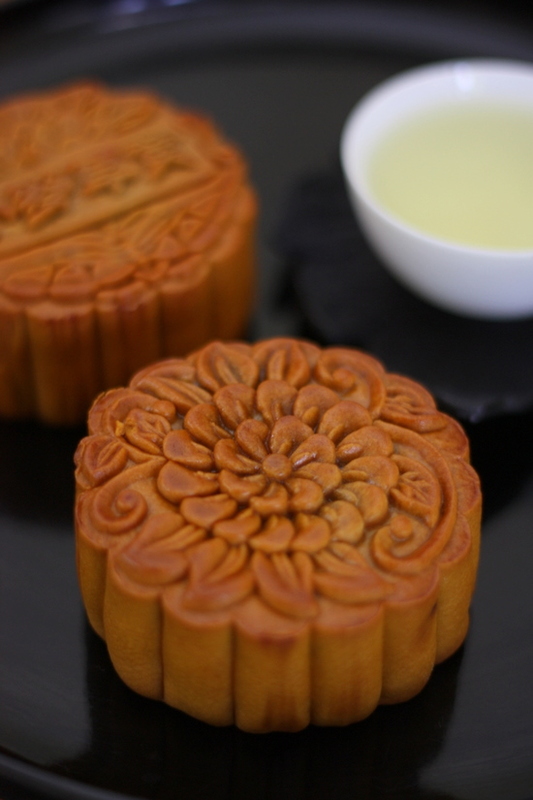 For those who like a tangy hit to their mooncakes, the summer theme of Golden honey grapefruit with pineapple is ideal. 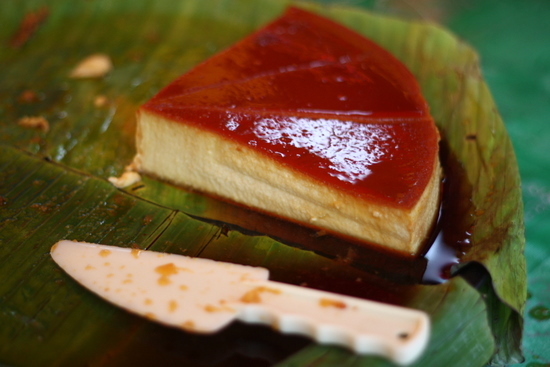 The grapefruit taste gives it an overall tanginess that undercuts the sweet taste of the lotus paste. I especially liked the pineapple centre since I’m a big lover of that fruit. For autumn, the Savoury white lotus with the shrimp sambal centre is definitely an acquired unique taste with the pungent dried shrimps aroma. Leaving the last for the best is my all-time favourite, the Snowy white lotus with sesame and custard for winter. 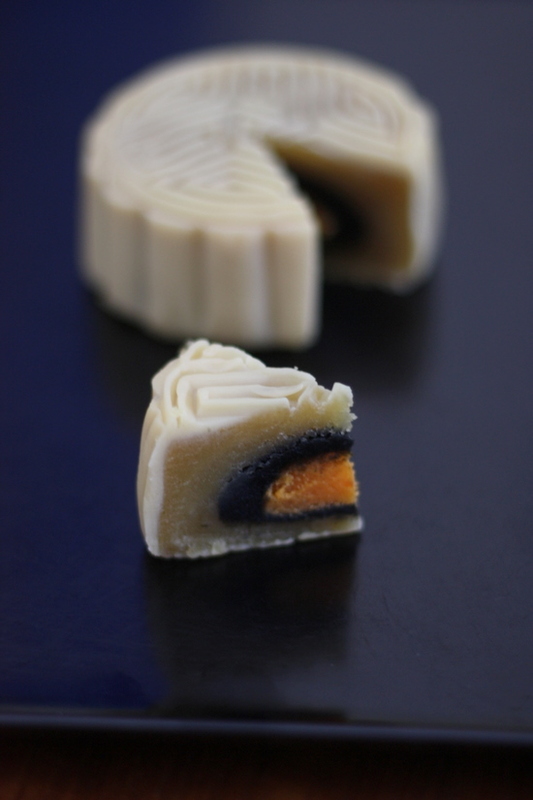 This mooncake skin has an alluring aroma of Chinese almond that pairs well with the black sesame and the creamy custard centre to give an irrestible combination. Rounding up their new varieties is the snowskin chocolate yoghurt with cranberry bits. These new varieties join other best-selling flavours such as Lotus Paste Double Yolks, Red Bean Paste, Low Sugar White Lotus, Jade Custard, Snow Skin Yam Paste Single Yolk, Snow Skin Durian Coulis & many more. 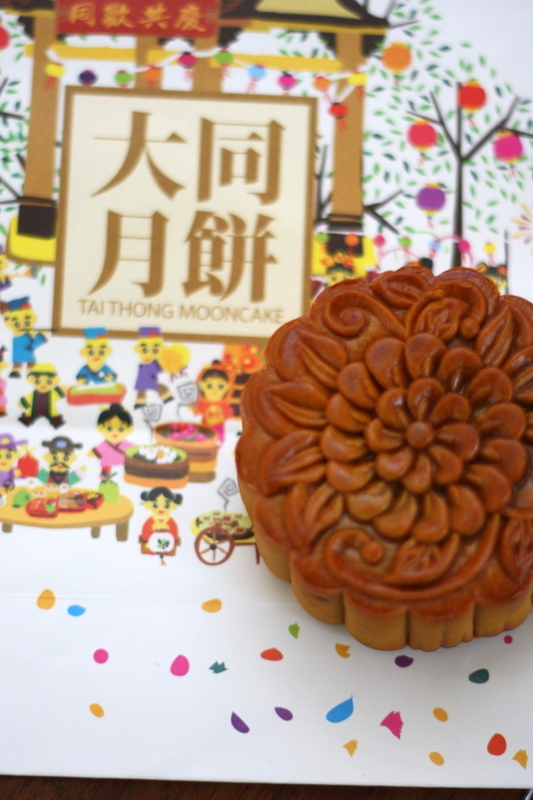 Another huge perk in buying their mooncakes would be the chance to win big in their “Sweetest Snapshot Contest”, the first ever Tai Thong contest for their Facebook fans. It runs from July 11 to September 4, with weekly prizes of coveted electronic goodies like Apple iPads 2, Apple iPhones 4 and dining vouchers. Each week sees one Apple ipad 2, RM100 dining voucher for first prize while the second prize is one Apple iPhone 4 and RM100 dining voucher. For Week 8, (starting from August 28) it is the Grand Prize week where you stand to win one Apple iPad 2, Apple iPhone 4 and RM500 dining voucher. Just like their Facebook page to start winning prizes. You will need to take photo of any of the new mooncake boxes, post it on the Facebook contest at the app with a caption, “I love Tai Thong Mooncakes because…” in less than 25 words. 5 posts with the most votes in that week will go on to the next round where internal judges will select the most creative photo and caption as winner. For the grand prize on week 8, all the same rules apply except that fans are to take a photo of ALL of the new mooncake boxes. 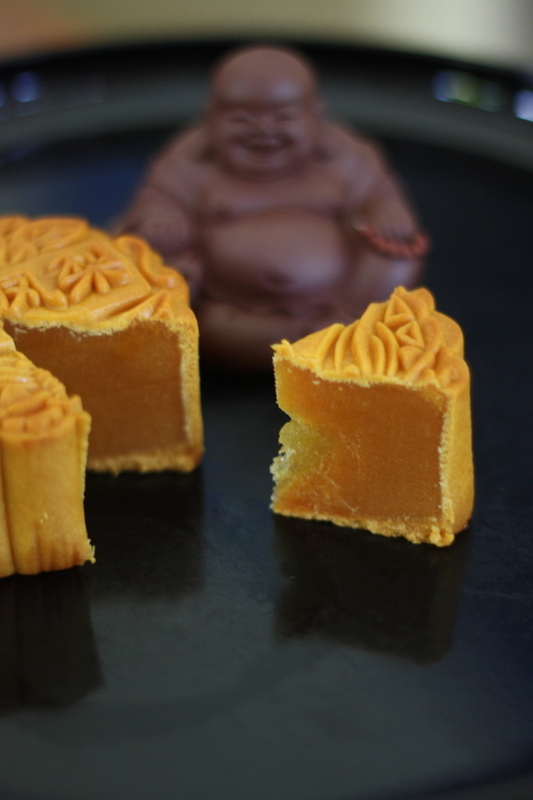 Sounds incredibly easy – buy, eat and snap pictures of the mooncakes – win big in the contest! *This is an advertorial. For more pictures, see the Flickr set. Sharing experiences are always way more fun I reckon. Especially when it is with people who have never been to Ramadan Bazaars. Apologies for the super long absence but as usual I got tangled up with work (the nemesis of my life!!). It's slowly getting back to normal this week. While any normal person would rejoice on that thought, I am secretly dreading it (shock, horrors those are the niggling signs of a workaholic). Back to the bazaar, I've been promising my friend J to introduce him to the joys of trawling through these month-long-only "eat streets" for some time. I finally managed to fulfill the promise last Sunday. Together with two fellow Ramadan Bazaar novices, we tackled the Taman Melawati bazaar in full force. I guess they all got carried away....the three of them went forth into bazaar land and grabbed everything that took their fancy. I was just happy to stroll around snapping pictures. I've always loved returning to a familiar bazaar - you spot people you recognise from past years like the tempoyak guy with his solitary pot doling out the durian scented coconut milk broth, the multiple nasi lemak bungkus varieties and the Indian family selling vadai and putu mayam. Balancing the tension of the old are new and fascinating stalls like the akok seller who uses the traditional charcoal fire to cook the East Coast egg-and-coconut-milk delicacy. 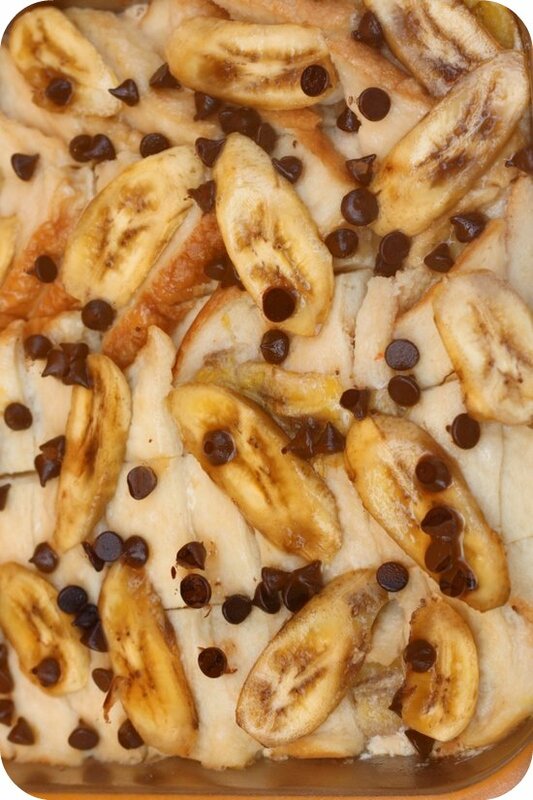 Usually a gas fire is used to cook this sweet treat since it is less tedious. The charcoal fire method produces a soft wobbly custard infused with a slight smoky flavour that makes it one of the better akoks I have tasted. 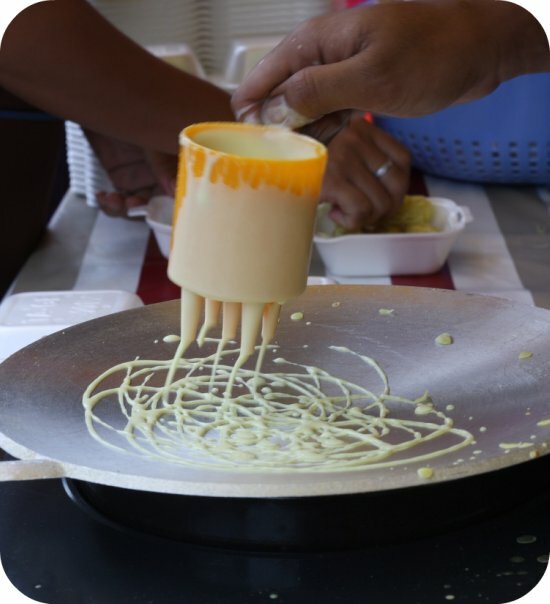 I was equally fascinated with another rarity, the lempeng stall. 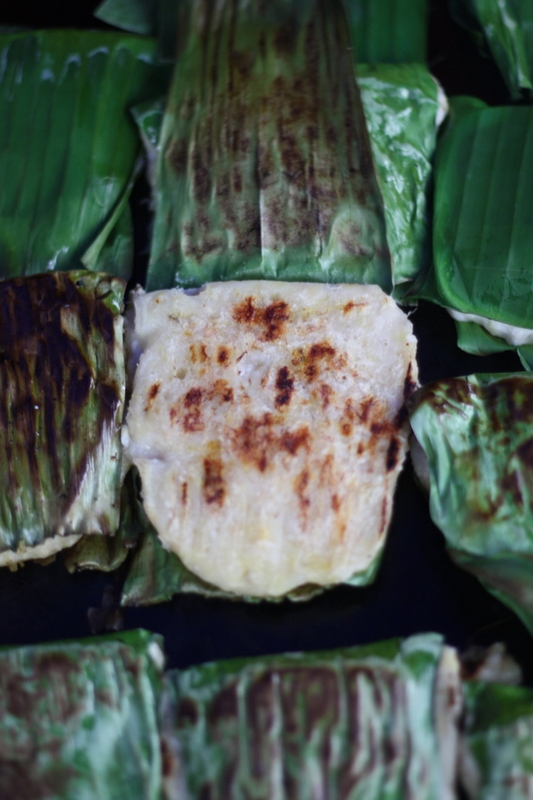 The pancake like dessert is made with freshly grated coconut and chopped bananas that is wrapped in banana leaf to grill. 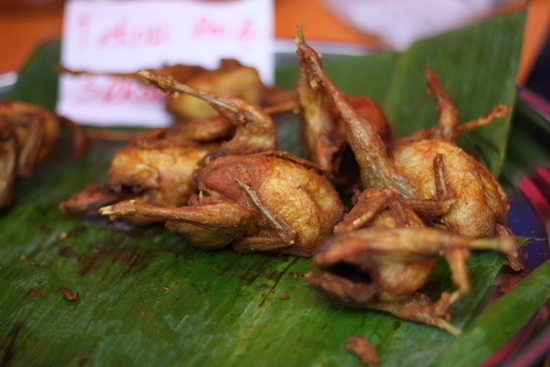 While I don't see this often, it seems this delicacy is also offered at the Taman Greenwood Ramadan Bazaar, a place I visited quite a few years back. 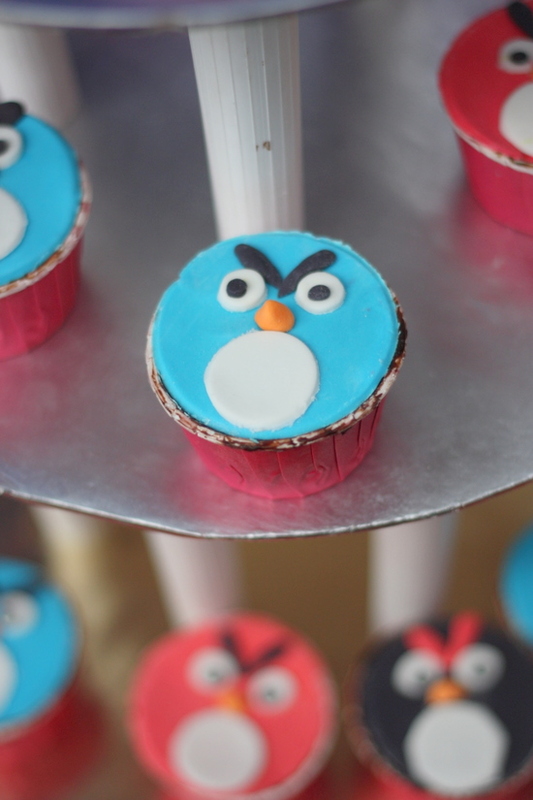 With the traditional, there'll always be stalls selling whatever is trending, like Angry Bird fondant topped cupcakes. I guess these will appeal to the younger set. 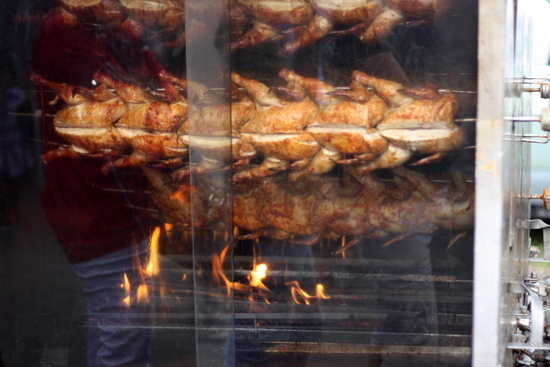 Since we were a little late, the bazaar was in full swing, chicken being grilled in various ways - over charcoal fires - in specially made rotisserie cabinets. 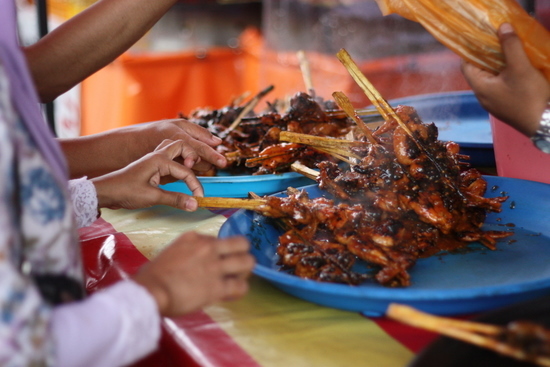 The whole chicken stall near to the highway seemed to be doing roaring business with a huge queue but we did score some aromatic ayam bakar that didn't need much wait. The traders seem to have upped their game here. 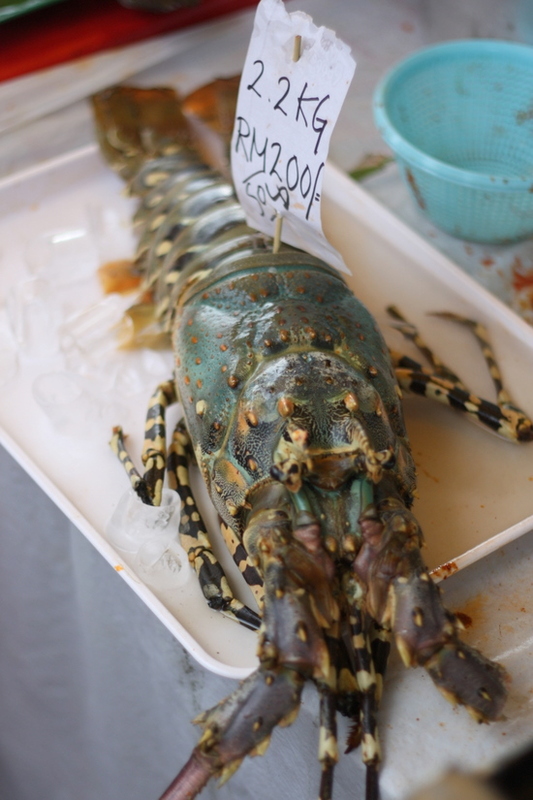 Spotted one ikan bakar stall touting deluxe lobster! I almost missed it until they kept pointing it out. There's a sign on it which says it has been sold, wonder who scored the crustacean for buka puasa that night. 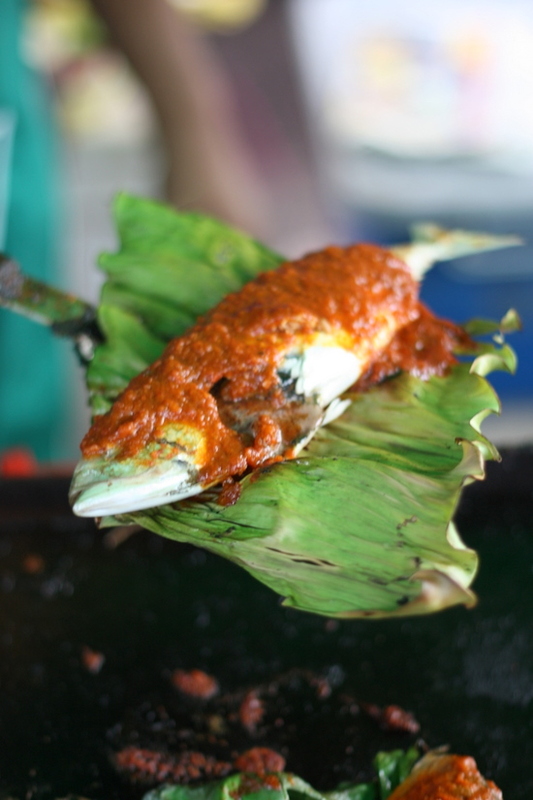 Instead we settled for the more humble ikan kembung bakar topped with lots of sambal. It lacked much punch though. Would have preferred the stuffed cencaru variety usually found in Kelana Jaya. 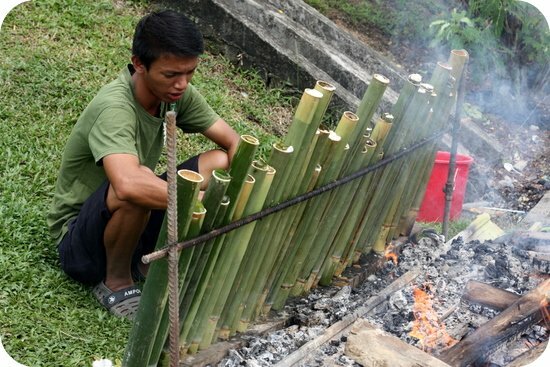 A must-have for Raya would be lemang, the glutinous rice cooked and grilled in bamboo tubes. Accompanying it would be rendang, slow cooked beef in a rich coconut milk spiced gravy. 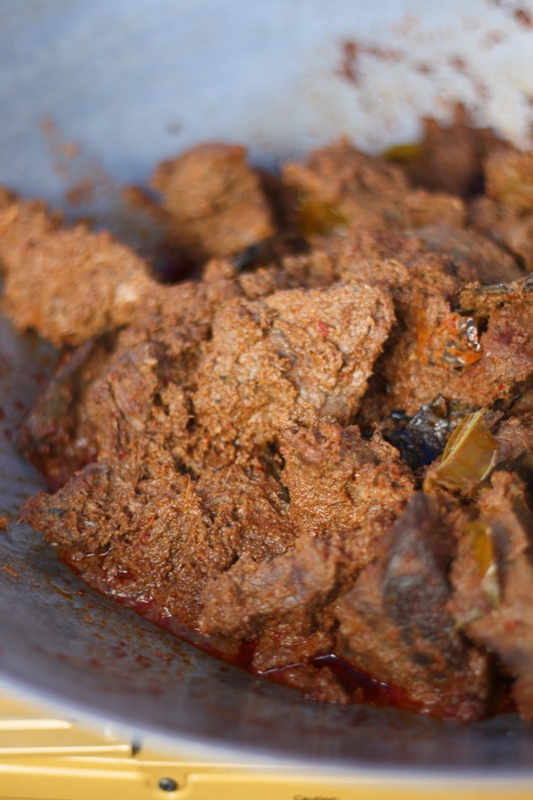 One of my all time favourites is the drier but super aromatic rendang tok from Perak. We made a hasty retreat from the bazaar with the raindrops falling, a prevailing hazard nowadays especially since the monsoon rains beckon round the corner. Tasting the whole haul (imagine one table full of plastic bags with various items) was a mix of hits with some mediocre and one super fail item (the tofu bakar). 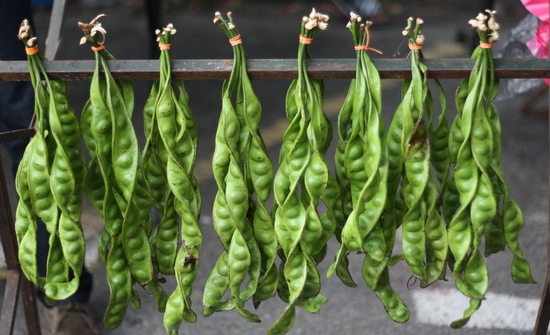 I'm not too sure if this could be the last bazaar posting but I definitely will try and slot in the Kelana Jaya one this week since I have always loved the laksam from a particular stall there. Hopefully they have not packed up and gone back to kampung as I have heard that most people are now making their way home for the celebrations already. Fingers and toes crossed I get to eat my favourite laksam this year. It always amazes me how good plans go awry at the last minute. I had grand plans for tackling the far flung ramadan bazaars for the weekend BUT a shoulder sprain or strain plus that stupid thing called work threw life in disarray. Since there was no way I would even be able to hold a camera and snap pictures, I decided to forgo the bazaar. Back to the bazaar, which I stumbled upon last year. Unlike the previous year, the authorities seem to have done away with the massive tents that covered the walkway and left people to fend in the forces of nature. It makes slightly better picture taking since it is brighter but I do wish they had not picked magenta as the tent colour since some pictures end up with a reddish tinge. The bazaar is massive. I reckon there are 250 stalls all jam packed in this space in front of the lake. 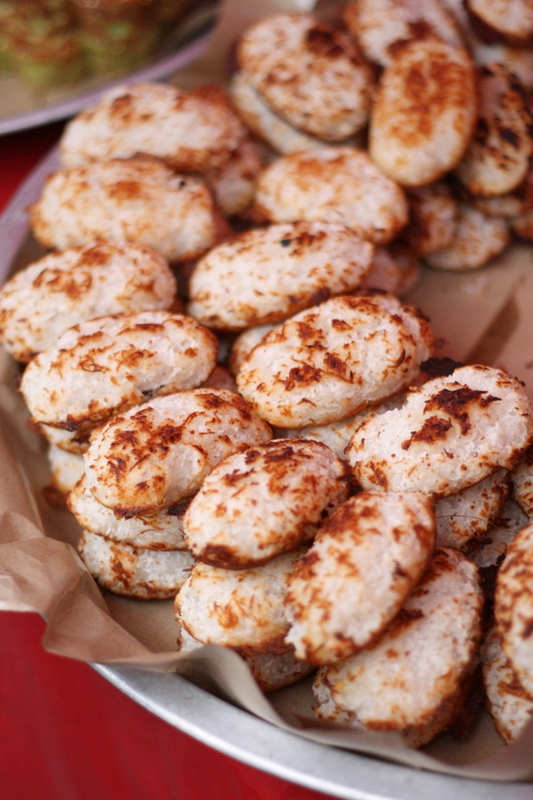 There's some new fangled items here such as the adorable polka dotted steamed rice flour cakes or apom. The artful dots and contrasting colours give it a ladybird look that kids adore and obviously can't resist. The creme caramel and fruit puddings stall I featured in Taman Tun Dr Ismail also has a branch here selling the same wares. There are slight differences though as they don't look so artful. 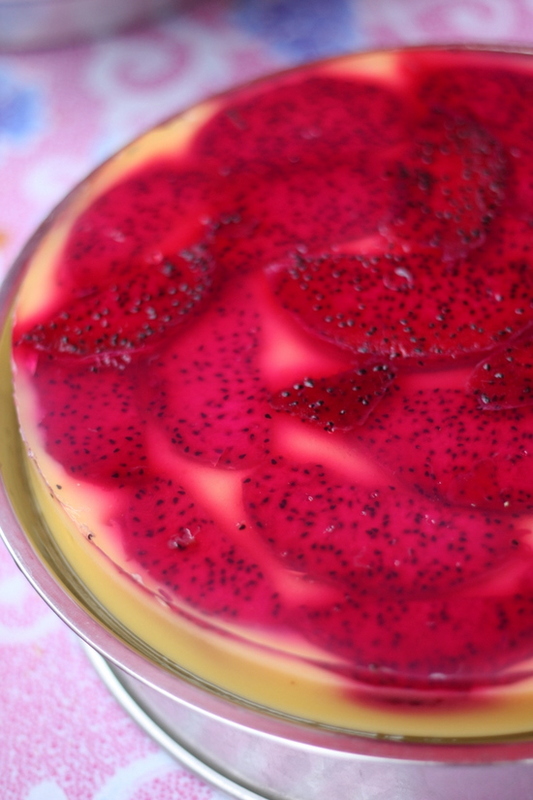 Nevertheless they have the fuschia pink dragonfruit jelly that makes the knees weak. Incidentally, I had a taste of the creme caramel from this stall and its pretty darn good stuff - smooth eggy texture that goes well with the sweet caramel. In terms of unique stuff on sale, there seem to be quite a few vying for that award. 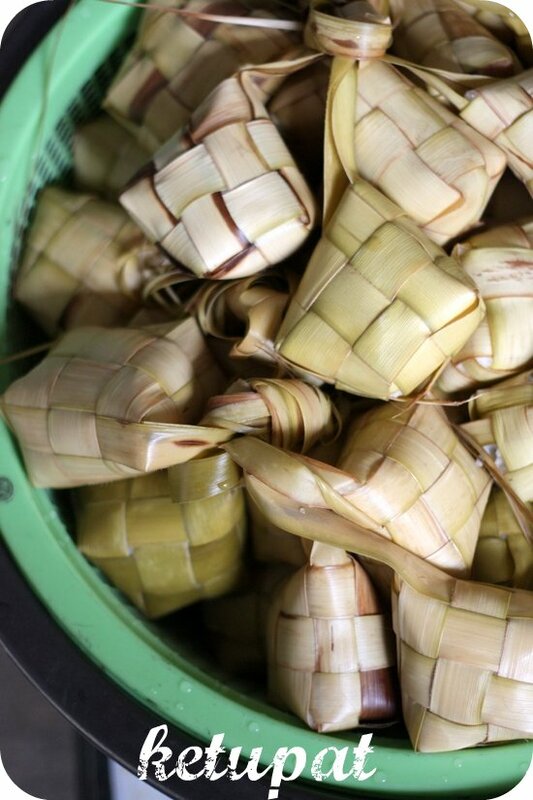 We stumbled on an old favourite, tepung pelita. 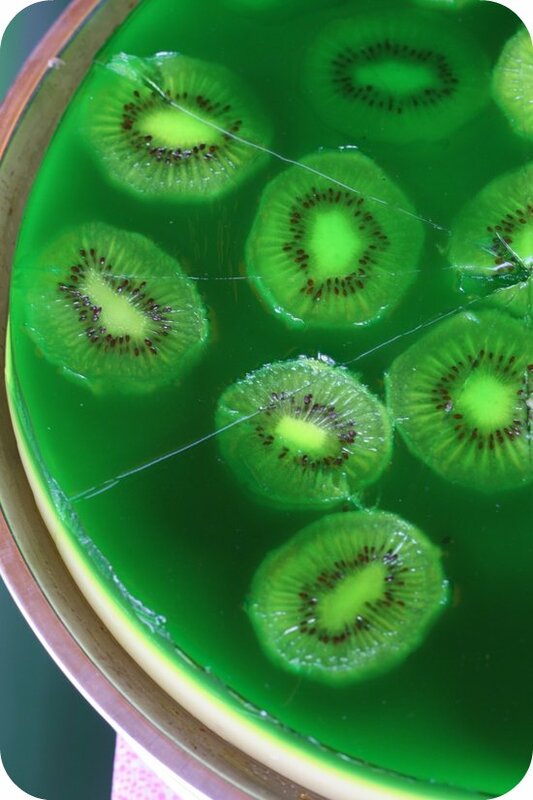 The soft wobbly dessert is usually in a leaf basket. 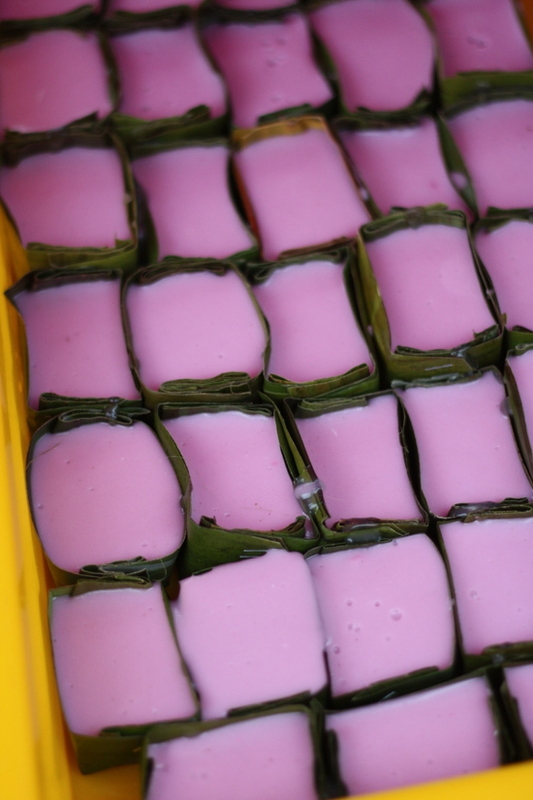 Usually made of coconut milk with a pandan layer below, they serve the taro version here - purple lavender layer with a wobble and a harder layer below studded with taro cubes. It's unusual to look at but honestly, I didn't think much about its taste, probably because not a lot of taro was used. 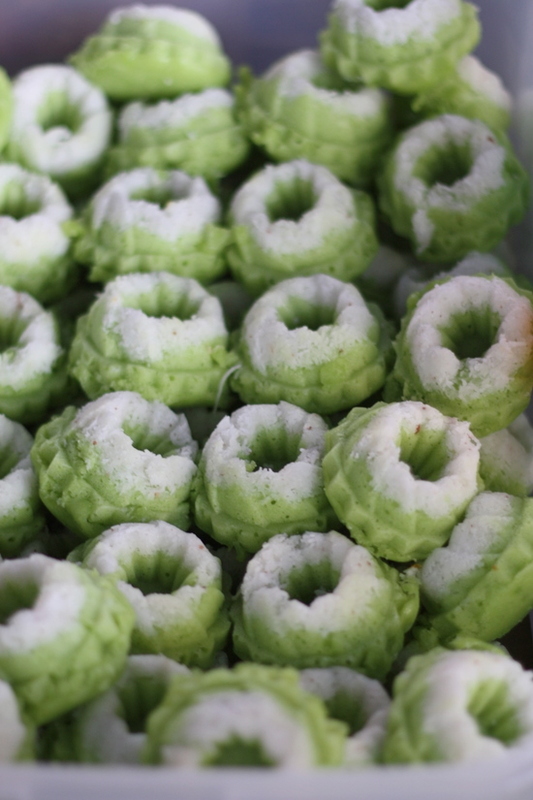 A twist to an old favourite is the pandan flavoured kuih bambu. 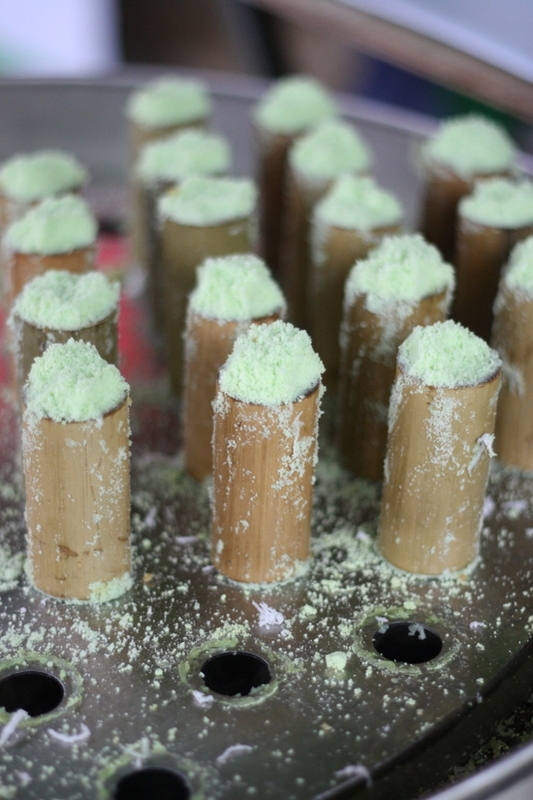 Rice flour is beaten with pandan flavouring (the guys claim with real pandan leaves). 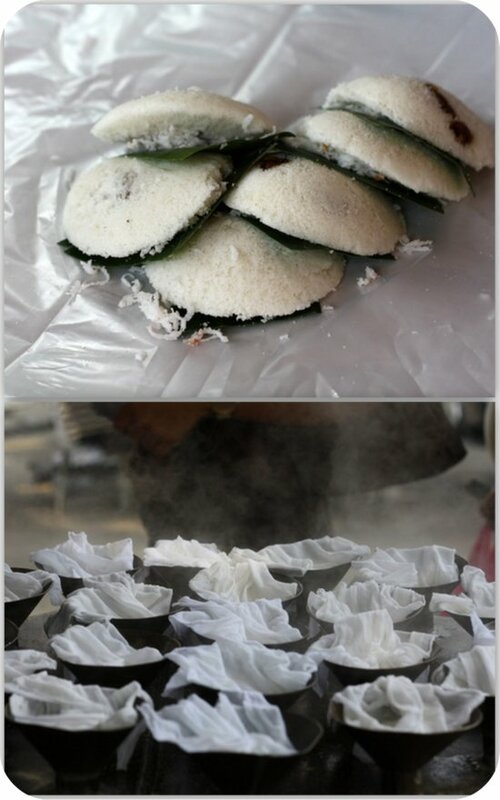 Technically meant to give it a bang of pandan flavour, the stall failed in executing it since most of the steamed rice flour cakes seem a little overcooked and not as fluffy as the other putu bambu stalls. The authorities seem to have segregated some stalls together i.e those with the huge smoke flumes are banished to a corner to smoke out their competitors. 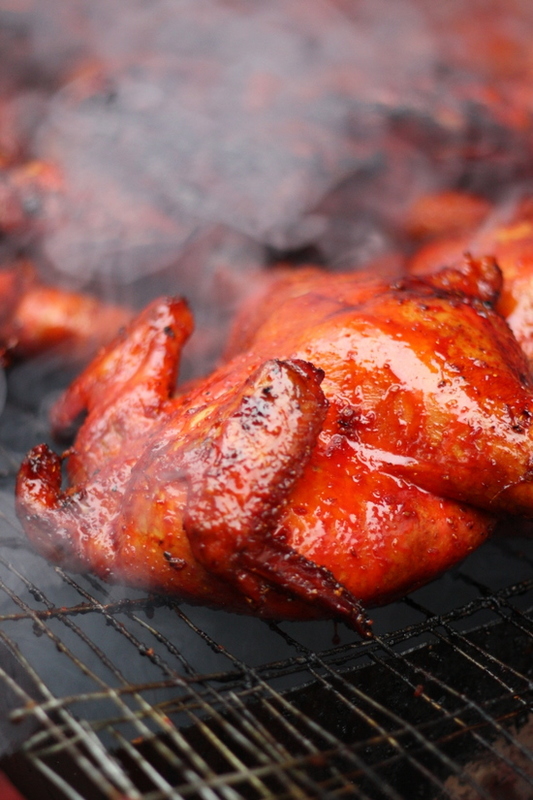 Special to this area I notice is the ayam istanbul or turkish - glistening chickens being cooked on the charcoal grill that is basted in a honey like sauce. Another specialty from here is the nasi lemak ayam dara - fluffy steamed rice perfumed with coconut milk and crispy chicken. Just spot the stall with the longest queue and you won't go wrong there. 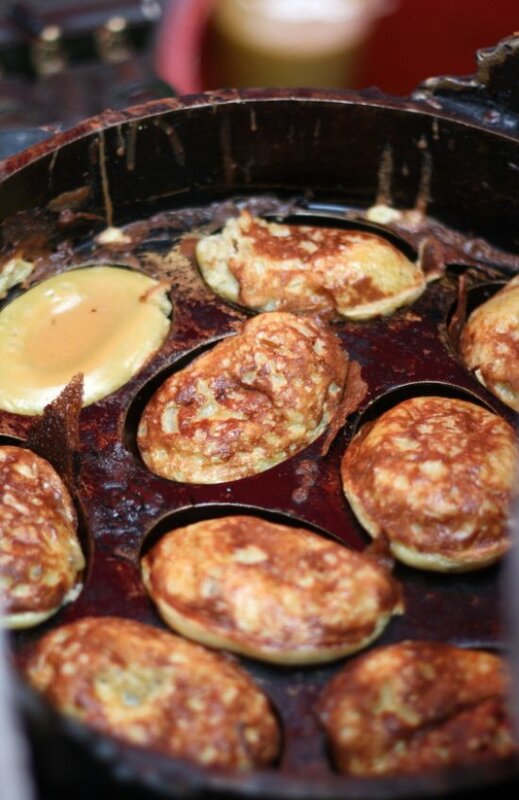 There are also akok stalls, the eggy custard rich cake. 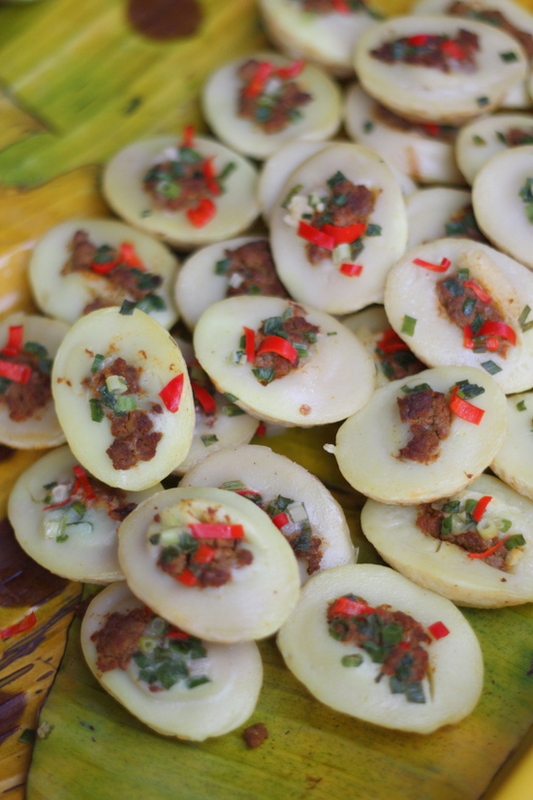 I spot so many stalls selling akok that trying to locate the guys I featured last year was like a needle in a haystack. 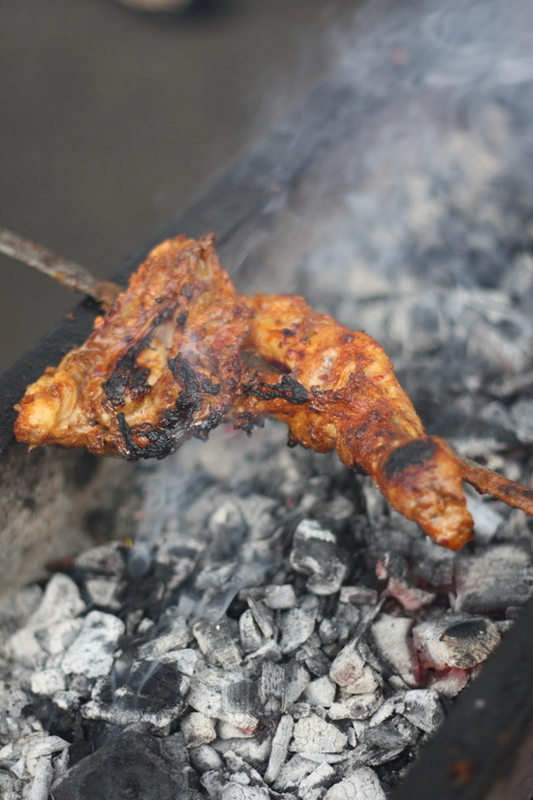 Overall, I enjoyed the bazaar with its mix of new and traditional food. Parking is on the roadside, ample space there for you to slot the car provided you don't arrive super late. For more pictures, see my Flickr set. For 2010's bazaar, see this link. Taman Tun Dr Ismail's bazaar may be oldie but it still draws a big crowd here. 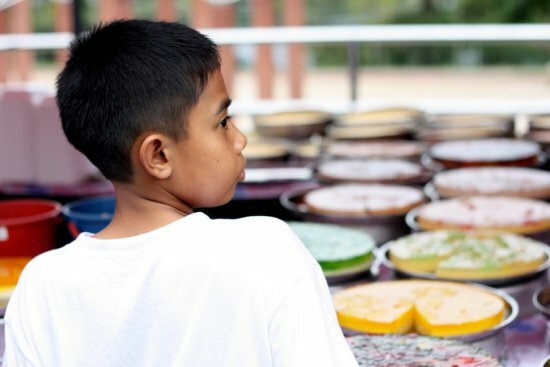 One of this bazaar's draws is their fruit puddings. They're so pretty that since you eat with your eyes, you are immediately lured into its colourful charms. 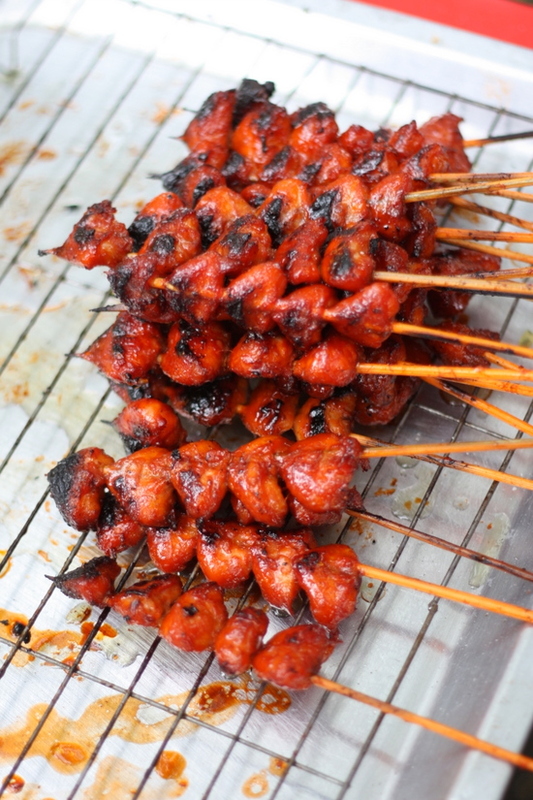 It is RM3 a piece and eaten chilled, it is perfect to break fast with. The girls who run this stall that also serves creme caramel, that sweet essential are both very friendly. 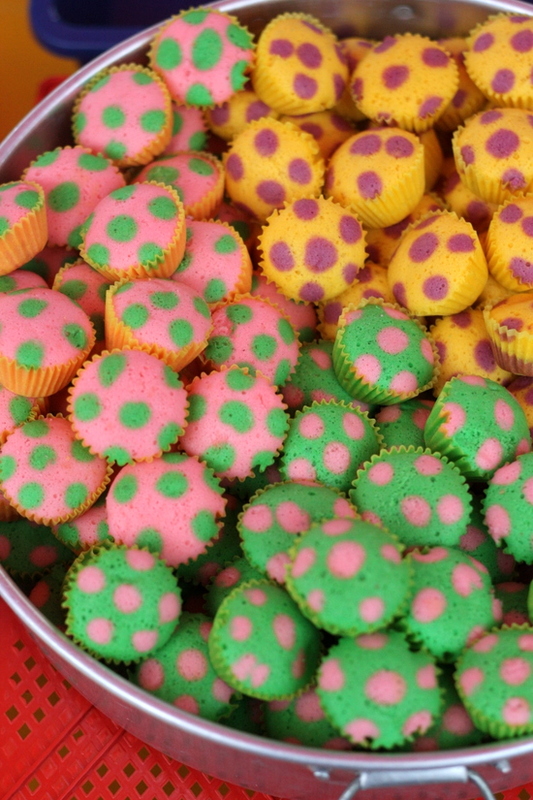 I find a lot of colour here, there's even multi coloured dadih, a milk based dessert that has a texture similar to agar-agar. Ice cubes were laid on top of the containers to try and keep it cool in the hot heat. 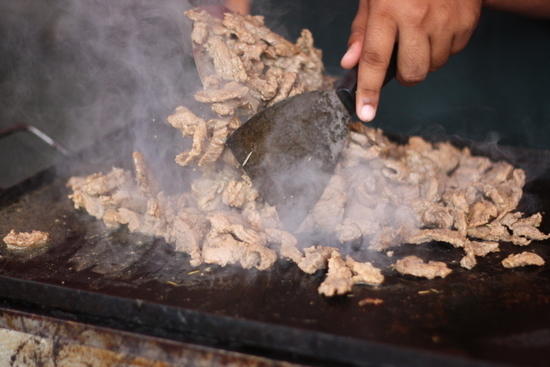 There are quite a few grill stations set up around the bazaar. 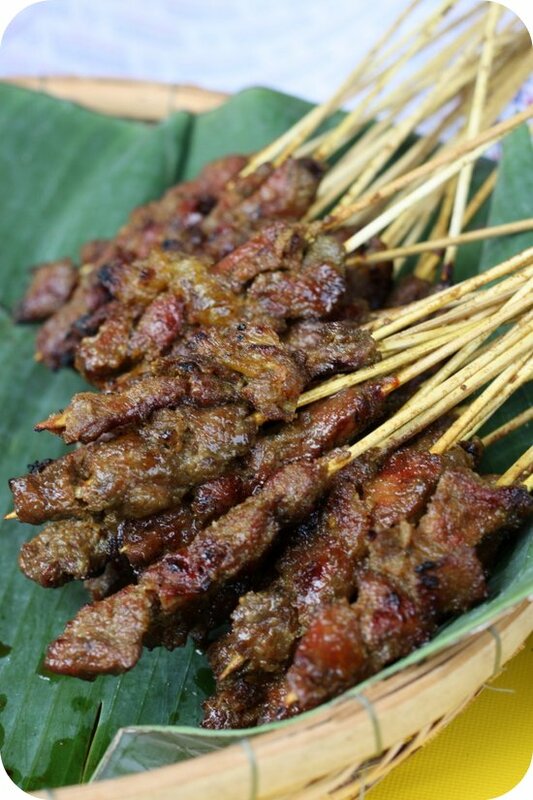 One of my big favourite is the satay stall, since the whole combination of smoky grilled meat combined with rice cubes and peanut sauce. 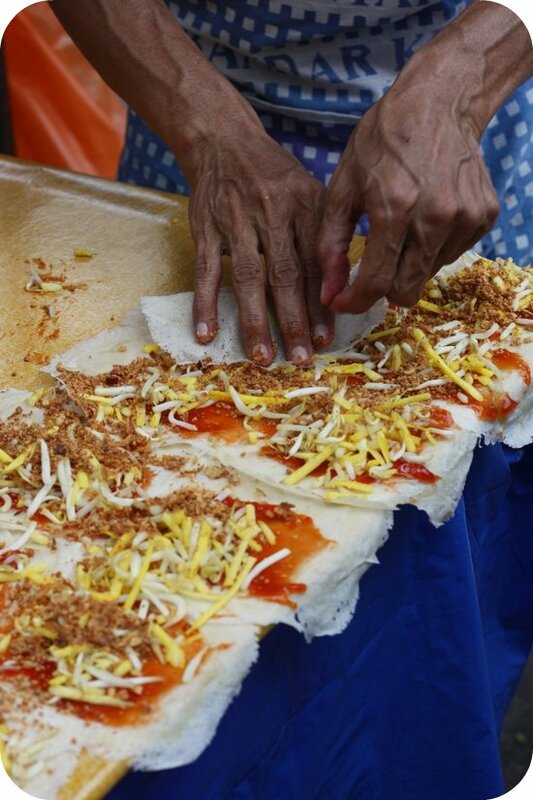 Murtabak is definitely a big favourite everywhere and each bazaar has their own versions. This place sells an unusual combo served akin like a 10 inch burger - a thin murtabak sandwiched between roti arab. 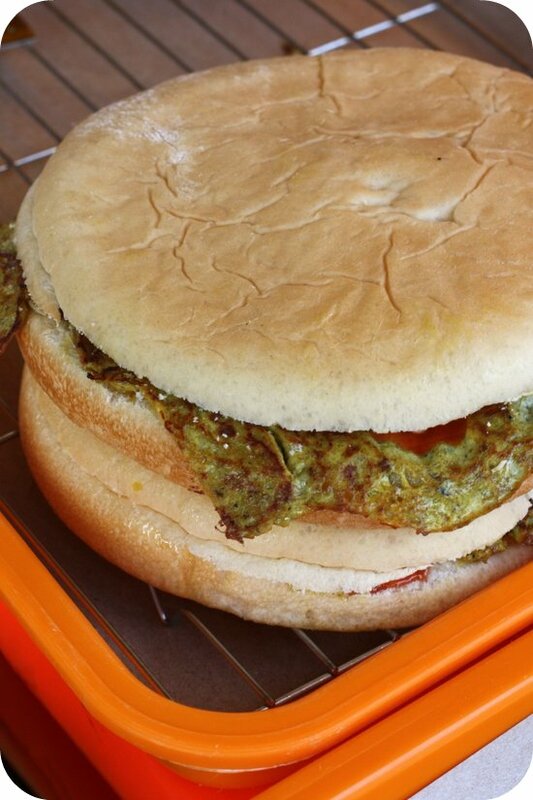 It lacks the condiments and sauces that it can be a little dry so it may be best to add on the tomato and chilli sauces yourself. I was fascinated with the Raja Murtabak stall as they added pieces of cheese within the murtabak - yummy combination indeed. 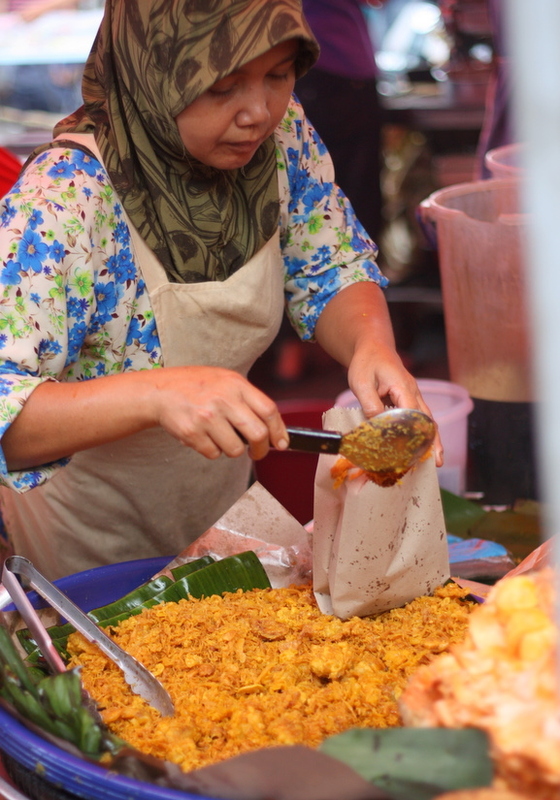 Since I was early, I didn't manage to catch my favourite briyani rice stall as they often arrive at the last minutes. Despite their lateness, people will queue up ahead for their food. Will definitely try and catch them another time. 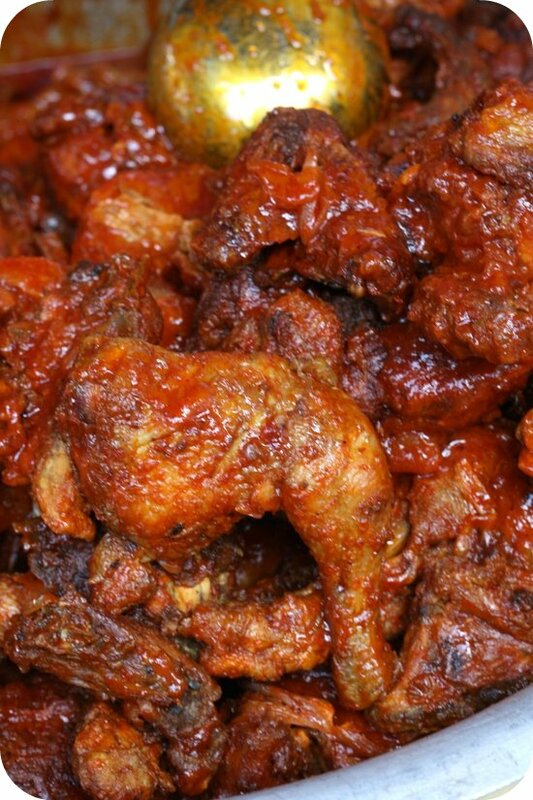 One stall sells two versions of ayam percik that make my mouthwater since you get to choose between the Northern pale thick coconut rich version and the Southern orange spicy version. 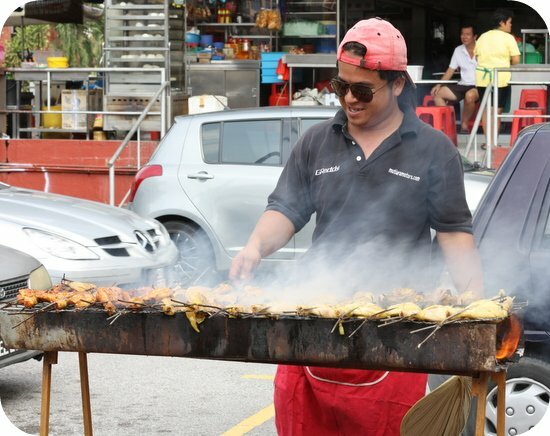 Kudos to those guys who stand under that heat and cook up the ayam percik over a hot grill. They are really our food champions since it is not easy to do that when fasting. Putu piring is always a big draw here too and this version (the one with this lady on a poster) is quite small. They have also expanded to two stations to tackle the queues a little faster. 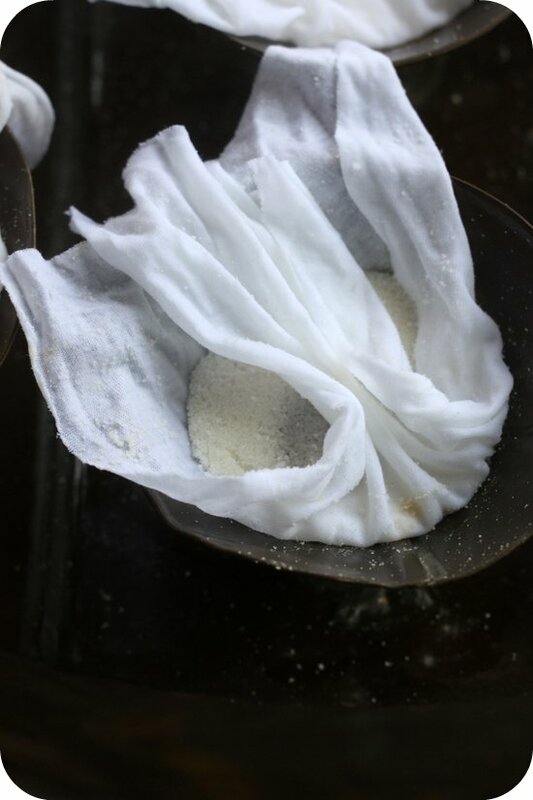 It is simple to assemble - place a mound of ground rice flour on top of the mould, add a pinch of the semi melted gula melaka, top it off with more ground rice flour, sweep it over to flatten and wrap it with a piece of white muslin cloth. Place it over the steamer (upside down and take away the mould). 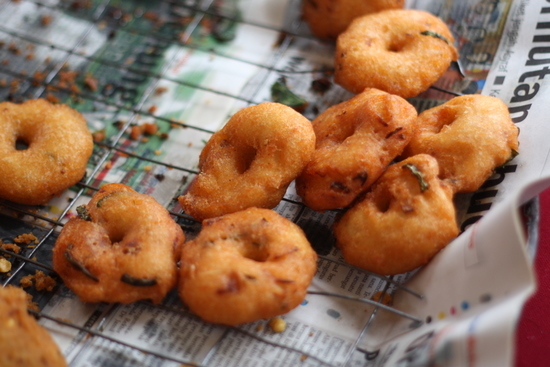 Once it is ready, remove and sprinkle with freshly grated coconut and a piece of pandan leaf. Eat when hot as it is fluffy and soft with a meltingly good sweet center. Whole lamb stalls seem to be growing here. There's two of them here slowly grilling the lamb over charcoal fire. I stumble on this roti jala stall with four stoves going on at one go. They have a great rhythm - one guy swirls the batter, another will take it out once it is done and another folds it for packing. One of the most popular popiah stalls is Power Popiah (I can't remember the actual name) with his tall stack of deep fried popiah rolls but I reckon this smaller stall is a better draw. It always make a great picture with the spread of popiah skins and the different stuffings. Sweets always dominate and this innovative stall came up with their various bread and butter puddings. Each piece is RM1.80 and you get flavours like banana, chocolate chip, almond, peanut butter, blueberry and strawberry. And don't forget the custard sauce. Like all newly started bazaars, the authorities are out in great force checking to make sure the stalls are orderly and following rules. Have a go at the bazaar but watch out for the crazy traffic around it since the infamous jam for the road that leads to 1 Utama is forever clogged up.